You’ve probably heard the idea behind the “cheat meal” before. A cheat meal diet is one that consists of healthy eating all week and a once-weekly cheat meal that consists of anything you want. For example, Monday through Sunday, you might eat egg whites and dry toast with tomatoes for breakfast and a salad for lunch. And Monday through Saturday, your dinner might consist of chicken breast or fish and a vegetable. But on Sunday night for dinner, you go crazy. You might go out for deep dish pizza, order in the tastiest Chinese you can think of, or gorge on a pint of Ben & Jerry’s. The world is your oyster…for one meal. Then it’s back to the diet life. Are Cheat Meals Helpful for Lasting Weight Loss? The answer to this question ultimately depends on who you are and what your weight-loss style is. However, let’s first take a look at the cheat meal “in a vacuum.” In other words, let’s imagine that you execute this meal plan perfectly, eating just one cheat meal per week and doing extraordinarily well on your diet for the rest of your meals. In this case, yes, a cheat meal diet can work perfectly well for lasting weight loss. That’s because essentially, weight loss through diet and exercise is all about creating a calorie deficit, and even if you eat a cheat meal once a week, you’d still be creating a deficit in your calorie intake. 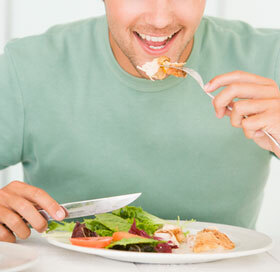 Furthermore, cheat meals can actually be better for ultimate weight loss than stringent diets. They first help you to loosen up a bit. Severe diets that cut out certain foods completely or don’t allow for any wiggle room whatsoever can wear you down over time. It’s easy to get frustrated and moody and then abandon them altogether. A cheat meal can break the restraints once a week. Additionally, some medical experts even believe that cheat meals can actually help you on your weight loss journey by spiking your metabolism. With that said, however, there are certainly drawbacks to cheat meals. Even though they can work when perfectly executed, cheat meal diets can be an invitation for trouble with some dieters. Usually, problems with the cheat meal diet occur when the cheat meal tastes and feels so good to the dieter that they turn a cheat meal into a cheat day, and then that cheat day turns into a cheat week. You see where this is going. • Go out to eat for your cheat meal. By going to a restaurant for your cheat meal and not taking home a leftovers bag, you’re not even letting any of the “dangerous” inside the house. If you’re worried about the temptation of extending your cheat meal to a cheat day or week, this is a good tactic. • Or buy only the amount of food you want for one meal at home. If you don’t want to go out to eat for your cheat meal, buy only the amount of food that you need to make the cheat meal for yourself at home. For example, if you decide to make a birthday cake and ice cream and eat it as your cheat meal, don’t make an entire cake and buy a gallon of ice cream. Bake a mini cake, and buy a small container of ice cream so that there aren’t any left overs. • Better yet, don’t eat ice cream for your cheat meal. With the traditional idea of a cheat meal, you can eat whatever you want. But if you want to be a little extra good, try to stick to things that are just a little outside of your calorie range. For example, eat a vegetable-loaded pizza or a big steak with a baked potato as your cheat meal. These aren’t exactly diet foods, but they’re still fairly healthy. • Stop if it’s not working. Finally, be aware of how the cheat meal diet is working for you. Try it for a few weeks, and if you’re not seeing any progress or if you’re noticing that your cheat meal bleeds into the rest of the week, stop. Again, this is diet that can work great for some people, but it’s definitely not for everyone. Your best gift to yourself on this journey will be noticing which tips and tricks work for you, and which do not.